The U.S. Department of Education is rolling out a digital signage network powered by Navori Labs, delivering content to digital display screens throughout its Washington, D.C. headquarters. The department will extend the network to locations in Dallas and Denver later this year. A digital signage display informs employees about upcoming office events. The Department of Education facility services team selected the Navori QL digital signage engine following an extensive evaluation of several systems. Program manager Joy Jordan pointed to the QL platform’s multi-user capability as offering significant value for departmental communications, along with a simple user interface. Jordan stressed the importance for different users to easily build playlists targeted to specific screens, and how that creates a unified communications experience for the department. VisualPoint, a full-service IT consulting company working with the Office of Management, is tasked with building out the signage network for the Department of Education. According to Pedro Perez, president, the Navori Labs QL digital signage engine is built for quick deployment, with limited installation requirements at new locations. Digital signage displays can be used for multiple purposes around the office. 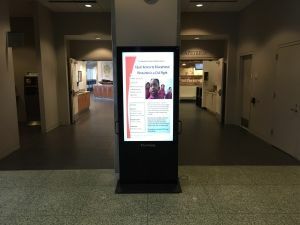 To date, the QL digital signage engine is reliably delivering native video, graphics and data to screens in high-traffic areas at headquarters, including lobbies, the cafeteria, and waiting areas by the elevators.“Digital signage really changes the way we communicate across the department,” Jordan said. “We previously relied exclusively on our website, e-mail, and paper fliers, and too often people weren’t receiving important information. Everyone likes the idea that they can look at a screen and get information as they wait by an elevator. These screens are our central point of contact now. Employees can take in the information and keep moving.